Showcased artist Patti Del-Checcolo with a piece of her art. Gallery at 409’s Board of Directors President Larry Bragg with showcased artist Patti Del-Checcolo. 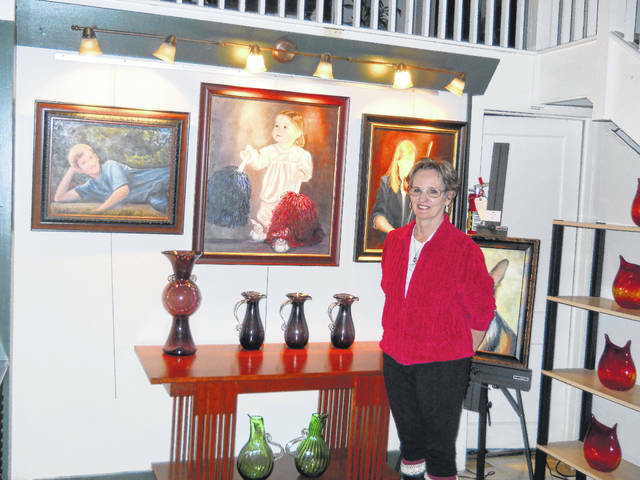 POINT PLEASANT — The Gallery at 409 will be featuring an artist from South Point, Ohio for its annual Christmas Gala. The fifth annual event will be held this Thursday from 6 p.m. to 9 p.m. The show for this year is, “Portraits and Fine Art by Patti Del-Checcolo.” Music will be performed by Cee-Cee Miller and a silent auction will be held. The event is free to the public, but guests may give to the contribution jar if they wish. Refreshments will also be available. 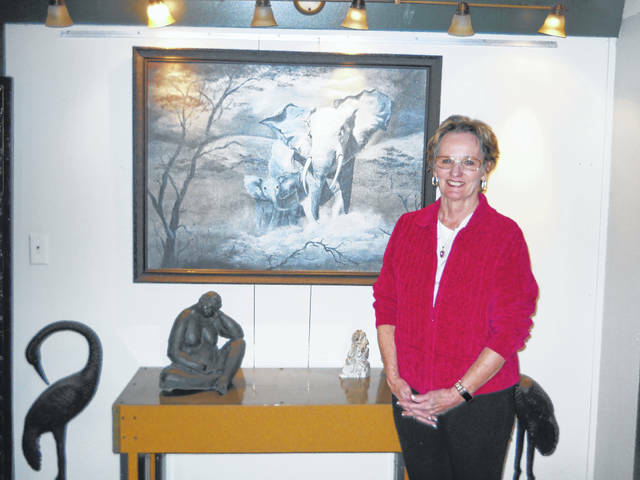 Del-Checcolo is native to South Pointand has been painting and teaching for 20 years. She teaches five classes a week to adults and children. Del-Checcolo teaches four classes at her studio in South Point called Patti Paints which has been open for 15 years and she is now offering a class at her new studio in Huntington called Third Avenue Art Gallery which recently opened in November. Del-Checcolo primarily paints landscapes, still life scenes, and portraits of people and animals. She shared that she wishes guests will gain an appreciation for the arts in general and become inspired to take an art class. Del-Checcolo said she is showcasing seven local artists at her new studio and hopes those who enjoy her work at the Christmas gala will pay the studio a visit. A painting by Del-Checcolo ranges anywhere from $100 to a couple thousand dollars. Larry Bragg, Gallery at 409 board of directors president and student of Del-Checcolo, expressed the Christmas gala has always been a successful event for the gallery. He shared around 150-175 typically show up each year. Gallery at 409 opened eight years ago and is ran by volunteers. Bragg said that at the start of the show there will be a dedication held for the late Rachel Proffitt who was a volunteer of the organization and a local artist. https://www.mydailytribune.com/wp-content/uploads/sites/42/2017/12/web1_1212.Gala_.jpgShowcased artist Patti Del-Checcolo with a piece of her art. https://www.mydailytribune.com/wp-content/uploads/sites/42/2017/12/web1_1212-1-.jpgShowcased artist Patti Del-Checcolo with a piece of her art. 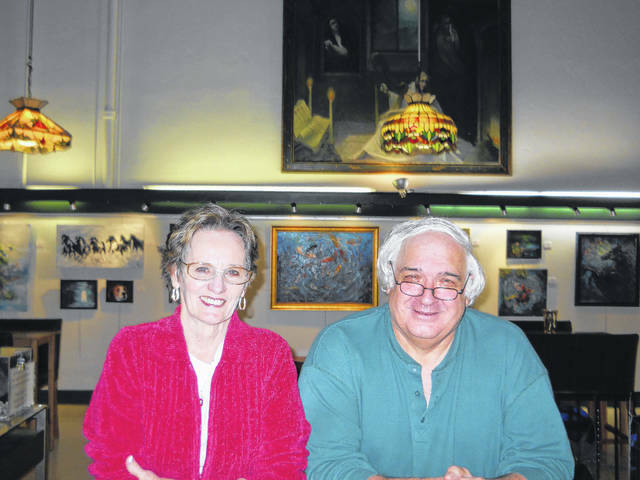 https://www.mydailytribune.com/wp-content/uploads/sites/42/2017/12/web1_1212-2-.jpgGallery at 409’s Board of Directors President Larry Bragg with showcased artist Patti Del-Checcolo.